Posted April 15, 2019, in testimonials. After graduating from Rutgers with my B.A. in Health Sciences, I will be attending Rutgers School of Health Professionals in pursuit of my Doctor of Physical Therapy degree. There, I will be immersed in courses such as human anatomy, neuroscience, and biomechanics. 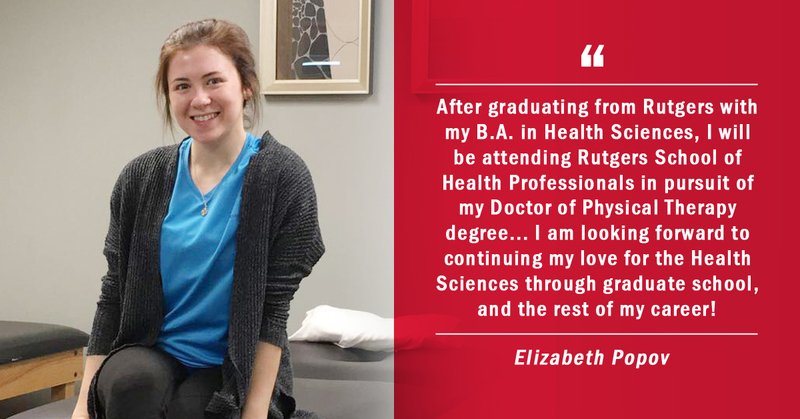 During these next three years, I will have the opportunity to participate in full-time internships where I will experience various clinic settings such as acute care, pediatrics, and orthopedics. I am looking forward to continuing my love for the Health Sciences through graduate school, and the rest of my career! Page last updated by Health Sciences at 3:49 pm April 15, 2019 . This page was printed from http://healthsciences.camden.rutgers.edu/2019/04/15/elizabeth-popov-rutgers-health-sciences-testimonial/ at 8:52 PM Saturday, April 20, 2019.